What can I say?? If it wasn't for "Deer Search" I never would have found this deer. I shoot my bow all year confidently out to 40 yards. Monday afternoon was perfect. 50 degrees and deer were in the fields at 4pm. At 5:30 this buck came off the top of the hill and bedded down 40 yards from me. A few doe entered the field below me which caught his attention and he stood right up. It was a 20 yard quartering away shot into the open field. Easy shot I thought. I either pulled it or hit some of the golden rod but the arrow entered the rear quarter and exited just in front of the other rear quarter. Horrible shot by me. I tracked the deer from 830 till 11 pm and backed out. Went back the next morning from 7 till 9am to where last blood was and couldn't find a drop. I made the phone call to Deer Search and we were back out in just a short time after. It took "Thor" 15 minutes tops to follow his nose to the buck. The deer had crossed the road and through some pretty thick stuff. 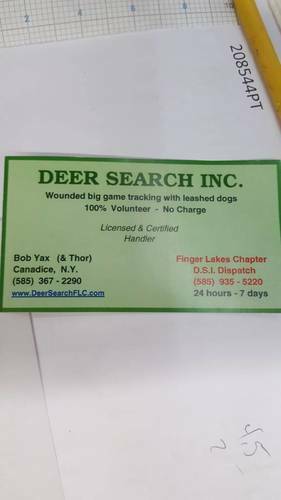 Without Bob and Thor from deer search, I never would have recovered this deer. The last pic is of Bob and Thor with the deer. Great buck and even better job Thor n Bob!! WOW that's a brute!! 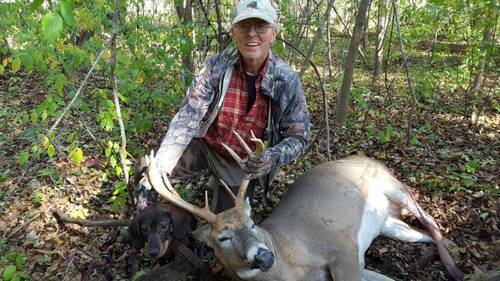 Thank you for putting the dogs on that guy, that would have been a sad story if you wouldn't have recovered that buck!! Congrats on your efforts put forth on finding your buck. I believe your arrow hit something at 20 yards you would of had to pull a foot or better to hit way back there?? You got it and that's what matters!! Thor is by far the best tracking dog in NYS! 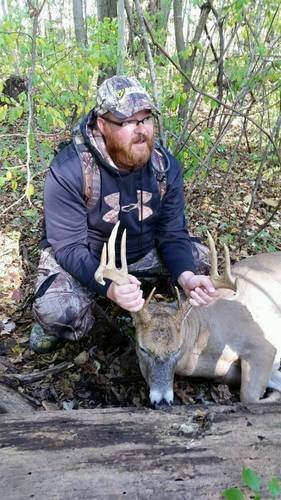 I have never had him on a deer personally, but have heard of numerous deer that he has found for people. If I ever need a dog ( hopefully I wont) I will do whatever is necessary to make sure he is the one to lead the way! 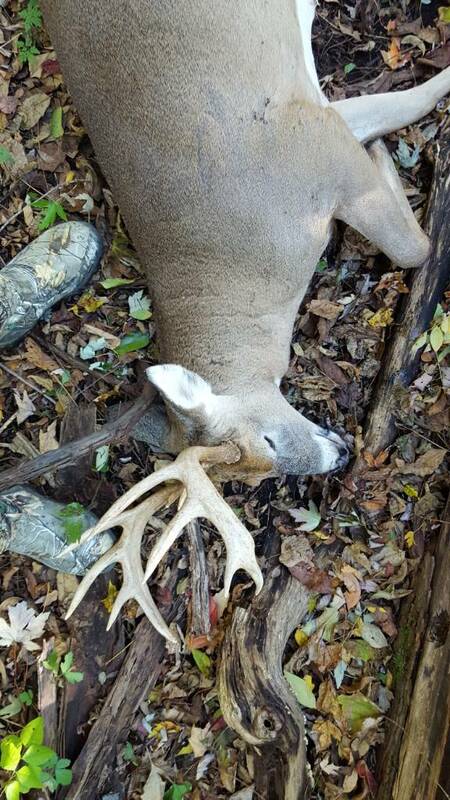 Congrats again on your buck. I've never heard of deer search. that's great. I've never thought of a tracking service either. I have a flunky beagle that likes to trail deer while rabbit hunting (that's now a house dog) that I have used for a few friends that have lost the blood trail to retrieve their deer. maybe I should advertise Here in Pa.? Thor is the wonder dog and Bob is an awesome tracker himself! I am proud to call him a friend! It is Illegal to track a deer in PA with a dog.. we tracked for 10 plus years in NY and got plenty of calls South of the border. PA should get on board with this service. My dog is turning 15 this month and she successfully tracked and found many deer. Soon there will be a puppy but until she passes I will have to hold off on tracking because of her old hips. 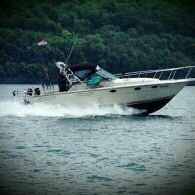 I miss doing it though.. You get to meet a lot of great guys n gals and the reward of knowing if your shot was fatal or not is very satisfying.